Author and speaker Marla Alupoaicei serves as the Director for Leap of Faith Ministries, an intercultural marriage support ministry in Frisco, Texas. Marla has authored or co-authored over twenty books and Bible study guides, includingTaking the Intercultural Leap,Generation Hex: Understanding the Subtle Dangers of Wicca, andIn the Flow: Spiritual Insights for Living a More Creative Life, as well as numerous nonfiction articles and poems. Marla has fifteen-plus years of ministry, teaching, and speaking experience with a variety of organizations. Currently she works as a staff writer for East-West Ministries, a grace-based church planting organization in Addison, Texas. Marla and her husband, Catalin, whom she met while on a missions trip to Romania in 1998, have been married for 7 years and currently reside in Texas. In an increasingly global and connected world, marriages between spouses of different countries and cultures are on the rise. Marla Alupoaicei, herself wed to a Romanian, helps couples sort through such issues as food, finances, family, and such "hidden" problems as different understandings of what it means to be "on time." 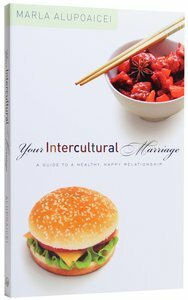 Marla combines real-life stories with expert perspectives and biblical insight for a helpful guide both for those just starting out on the intercultural adventure - and those in the midst of it. Marla Alupoacaicei holds a B.A. in English and Communications from Purdue University and a Master of Theology from Dallas Theological Seminary. She is a member of a variety of professional speaking and writing organizations, including the Advanced Writers and Speakers Association, The Dallas Christian Writers Guild, The Frisco Writers Group and The Writers View. Marla is the coauthor, with Dillon Burroughs, of Generation Hex: Understanding the Subtle Dangers of Wicca, and her articles have been published in Marriage Partnership, Kindred Spirit, Insights and InTouch, among others. In addition, her poetry has won several major competitions, including the Purdue Writing Competition, the Writers Digest Poetry Competition and the Dorothy Sargent Rosenberg Prize. Marla and her husband, Catalin, are the founders of Leap of Faith Ministries (www.marriageleap.com), which enables them to minister to artists, writers and intercultural couples across the globe.